Six of the 12 candidates for Minneapolis mayor debated the causes and cures of homelessness on Thursday. 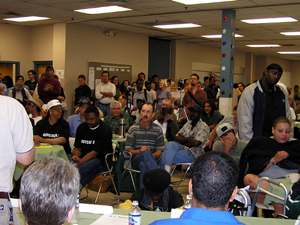 An audience of about 200 people attended the forum, held at Catholic Charities. The candidates did their best to address the concerns of the homeless community, but many in the crowd left the forum disappointed. Minneapolis, Minn. — The event was organized because groups that advocate on behalf of the homeless say their concerns aren't being heard. Once the forum started, it was clear this was not going to be a typical mayoral debate. Many people in the audience were homeless so they didn't have time for canned political phrases. Some said they were more concerned about where they were going to sleep at night. That urgency supercharged the crowd. People in the audience hooted and hollered when they heard something they liked and grumbled at answers they didn't appreciate. Marcus Harcus, a candidate who has run for several other city offices in the past, received strong support when he talked about ending police brutality and overzealous police officers in the city. "Serve and protect really has to happen or police officers need to go. I'll terminate them. I'll work to terminate all rogue cops," he said. The candidates did their best to address the concerns of a population that often goes unnoticed. The forum touched on many topics, including affordable housing, developing a good bus system and the need -- or not -- for a new Twins ballpark. But other issues, like restrictions on panhandling and allegations of police brutality, were also front and center. Hennepin County Commissioner Peter McLaughlin says he's been a long-time advocate for low bus fares and affordable housing. He says he'd continue to work on homeless issues if elected. "It's about sitting down with the homeless and making sure your views are heard. It's not about press conferences and statements. It's about getting things done and getting things done together," he said. McLaughlin's comments were directed at Minneapolis Mayor R.T. Rybak, a fellow DFLer. They are the two best-known candidates running for the city's top job. Throughout the forum, McLaughlin and Rybak often exchanged barbs over who's done more lobbying at the state Legislature and which candidate has worked harder on affordable housing and homelessness. Rybak says his first term focused on building more affordable housing to the city. He says his current budget aims to lower the rate of homelessness. "Join me in this effort to put the temporary back in front of the word shelter," Rybak said. "Shelter is a great thing but it's not an end to itself. We've launched a new initiative to tie jobs and permanent housing to make sure that this city does not have homelessness." The audience didn't seem to care who the perceived front runners were in the race. In fact, someone in the audience asked Rybak who he was when he didn't introduce himself during his opening comments. Many also voiced their displeasure when McLaughlin and Rybak both said they supported a county-wide sales tax to build the Twins a new ballpark. The four other candidates at the forum oppose the tax. Green Party candidate Farheen Hakeem said she's the only woman in the race and talked about her past as a community organizer. "Many people will tell you that we need someone in the mayor's office that's willing to roll up their sleeves. Well, my sleeves have been rolled up since I've been here. We need to keep that going," she said. Candidates Mark Koscielski and Tim Nolan were also in attendance. They say they'll continue to meet with the homeless community and will work to create more affordable housing units if elected. Nolan said "we need to build more affordable housing units in the city. We have a lot of boarded up building in this neighborhood and all we see are condos being built." Koscielski said he wants to create a 24-hour hotline so people can call someone if they feel they've suffered police brutality or abuse. "If you feel like you've been mistreated, before they book you into a jail, they have to hand you a cell phone and you can call this 24-hour hotline. An advocate will be there within one hour to address your complaints and take your complaints." Some audience members interrupted the candidates when they felt their concerns weren't being answered. One wanted to know why he couldn't sleep in the city parks when the shelters were full. Others, like Roger Buford and Arthur Dillard, say they want good-paying jobs and low-cost housing. "We can't afford the rent around here. They won't give us jobs. What can we do? Then they wonder why we sell drugs and wonder why we make money that way. Then they lock us up. That's crap," Buford said. "We need help as far as gaining viable employment at an employable rate," Dillard added. "Those are the kind of answers that need to be answered here, not that rhetoric about a bus pass or whatever else"
Several advocacy groups are working to boost voter registration among the homeless. They say politicians will start to listen to the group once it becomes a more powerful voice on election day. Their first chance is the non-partisan primary on September 13. The top two candidates in that election will then face each other in the November election.